The next big enterprise will be weed, followed closely by everyone and their grandparents starting up their own streaming service. With more and more American states and countries coming around to the idea that the Devil’s Lettuce isn’t an entirely accurate nickname, we will no doubt see weed being commercialised to the point of it being almost as common as picking up a pint of milk within a few years, a near future that Weedcraft Inc tries to picture. A tycoon and business management sim with more depth than you may immediately realise, Weedcraft Inc has been erroneously described as a “clicker” by some, almost as if that’s some kind of life-ending insult. While it’s true that there is almost no need for the keyboard and the early goings will have you clicking more than an arthritic zombie during a marathon, Weedcraft Inc is a wonderfully complex game with many moving parts. Things are split into two different scenarios: one is for beginners and the other is slightly more advanced with even more mechanics to keep on top of. There’s a lot to unpack here to begin with, though the game does a great job of doling out incrementally more complicated systems the more you play. Within a few hours you will be juggling potassium levels, employee happiness, and cracking down on your competition like a true kingpin. 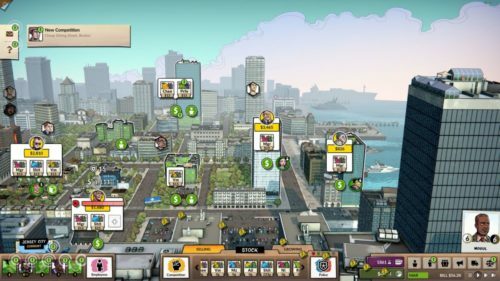 You are given a static overview of your city (there are six in total throughout both scenarios) in Weedcraft Inc from which you can choose how you establish your new weed empire. I went for a balance of legal and illegal activities, though the game is noticeably easier when you’re playing legally — or in the “greyer” area of legality. Weedcraft Inc really stacks the deck against illegal players with police vigilance constantly eating away at your money and employees so incompetent that they may as well be taken out back and shot. There’s a truly unpleasant grind and sense of attrition when you’re starting off a new scenario: months will pass where you feel like you’ve just scraped by with nothing but two bank loans to your name and a cramped clicking finger to show for your efforts. But when you do start to see the green (in more ways than one) and your empire’s foundations are laid, Weedcraft Inc itself just clicks. There are so many things to be aware of and micro-manage in Weedcraft Inc that it’s almost impossible to write about them all while discussing how intricately they compliment each other and impact your enterprise as a whole. While Weedcraft Inc may initially look like something you could find on the App Store, those wallet-bothering time-wasters wish they had half as many layers and ingenius ideas as this game does. Take, for instance, the aforementioned legal aspect. Weedcraft Inc allows players to choose between illegal, recreational, and medical distribution for weed. Going illegal will save you a tonne of money to begin with thanks to the lack of taxes but will ultimately send you down a sticky path that will create more headaches than it is worth. Opting for legal distribution will open up some doors and allow you to sell to different kinds of customers, but the high taxes — combined with legal buyers being much more demanding in terms of strain quality — will hamper your bottom line. The solution? Change the law itself, either through some healthy coercion via blackmail or by getting in good with the more malleable lawmakers. There’s even more to consider when it comes to the weed production itself. Not only do you have to find the right strain for the right demographic, but you also have to make sure it’s up to par with their expectations. Weed quality is defined by how well they’re tended to, the room temperature, soil, and lighting, but buying the best equipment doesn’t come cheap. Even if you have the best weed in the city, that doesn’t mean anything if nobody wants it or if the competition is too fierce, so you may have to play dirty. Either through simply beating the economic pulp out of your competition with cheaper product or by blackmailing them into taking a step back, there’s a tonne of freedom in how you handle the market. You can even team with another competitor to take down a shared rival, get in good with the cops and have them constantly crack down on them instead, or get your employees to steal one of their strains. You can even use science to breed a super mutant strain with specific effects after collecting research points to really corner the market and give the people want they want. While you technically don’t have to, Weedcraft Inc is much better when you’re progressing through its story by completing miniature quests, which really just acts as a continuous tutorial that teaches you the ins and outs of the game as you go. These can range from the mundane (sell X amount of Y) to the more inviting (forever change the weed landscape of a new city by altering its laws) with there typically being a good dozen or so for you to work through for each city. As for the characters and overall narrative of both scenarios, they feel like they just sort of drift by without saying or doing much of importance, which is a disappointment. Weedcraft Inc initially looked like it might offer some really flavourful looks at life in the weed business, but whether you’re playing as a young man who recently lost his father or an ex-con looking to make a name for himself again, it feels lightweight. Maybe it’s down to the cartoon-y aesthetic or the lack of voicework, but nothing really lands or registers as it should. Even though it broaches it through its mechanics, Weedcraft Inc doesn’t have much to say on the legality of weed itself in the real world, and, even more disappointingly, is slightly imbalanced in its portrayal of weed as it never once shows the ill effects of the drug. Weed is not all sunshine and rainbows. Weedcraft also lets itself down in its aforementioned early game attrition and logic, which go hand-in-hand with really testing the patience. As going “legit” costs serious money that you won’t have for a while, it can be a case of luck that the police won’t thoroughly ruin your day by and confiscating your stock and equipment while also giving you a fine. You can buy better gear that makes your growing less suspicious, but this takes up precious space in your growing room which you will need to produce weed so that you have any chance of expanding. Likewise, you can set up a front business, but this will somehow take up a space in your building despite the weed growing being below ground. It’s an illogical thing that shouldn’t irritate me as much as it did, but it really did. In addition to those flaws, employees in Weedcraft In. are beyond useless unless they are nearly maxed out in their specific skill, so much so that you are better off just doing the work for yourself in the early goings. The cultivation “mini-games” are fine in isolation, but when that’s all you’re doing for up to an hour to try and eke out enough money for vital upgrades, you may be tempted to light one up yourself. Couple all of this with the odd random fine and neediness of your employees at points and you have a recipe for some irritating initial hours that may turn some players away completely. However, as I’ve already mentioned, when things start to fall into place in Weedcraft Inc and business is booming, it’s hard not get to completely absorbed by it. After playing for almost fifty hours through both scenarios and enough free play so that I could earn over $4,200,000 (as God intended), it’s fair to say that it gripped me, so much so that it often reminded me of fond childhood memories of playing Theme Hospital and the wide-eyed addiction of simulated management through the lowest of lows and the highest of highs — pun only somewhat intended. Even if you have no interest in weed (I personally can’t even smell the stuff without fearing I will be thrown in a gulag full of dragons), the deep and plentiful systems of Weedcraft Inc will give you more than enough to toke on.